As it celebrates its centennial, Columbia’s Hollywood-Rose Hill neighborhood is cultivating a sense of place in the city by working to preserve its history and build community among its residents. 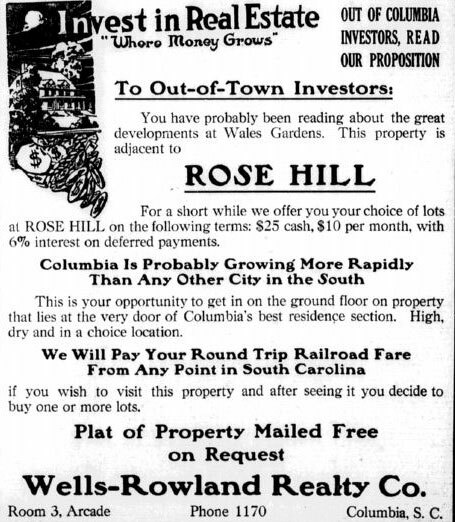 Courtesy of The State newspaper, this advertisement lists homes for sale in Rose Hill in August 1920. A century ago, Hollywood-Rose Hill’s first houses sprung up on South Edisto Street, a few blocks from what is now Rosewood Drive – bungalows, cottages and revival-style homes that now blend in among the others in the neighborhood. But their significance is not lost on residents like archivist and historian Chuck Lesser as the neighborhood celebrates its centennial. “We understand ourselves by our history,” said Lesser, a self-proclaimed preservationist. Hollywood-Rose Hill residents work diligently to retain the neighborhood’s history and give it a sense of place in the larger scope of Columbia. Community-wide events like children’s Easter egg hunts, park cleanups and picnics are planned annually, but for its centennial, the neighborhood has concentrated on creating special events, such as helping residents research their homes’ history. Former neighborhood association president Margaret McGee, who has been involved in the planning, said she appreciates Hollywood-Rose Hill’s sense of history and community. “It helps so much knowing who your neighbors are,” McGee said. Many residents are interested in understanding the neighborhood’s history because many of the original homes are still there, she said. Without historic preservation, it is impossible to fully define and preserve a sense of community, said Rhonda Phillips, dean of Purdue University’s honors college and a community and economic development specialist. Strong historic preservation in neighborhoods also tends to stabilize property values and provide a base to work with for school funding and other neighborhood projects, she said. Former neighborhood president Margaret McGee says she gained a better sense of Hollywood-Rose Hill’s history while heading the neighborhood association. The low property costs and proximity to downtown Columbia and USC’s campus, where he is the Education College’s associate dean of academic affairs, first attracted Zach Kelehear to Hollywood-Rose Hill. But the desire to be a part of a neighborhood with roots and an ongoing presence in the local community kept him around. “I feel connected to a narrative, to the story of the local community,” said Kelehear, who lives on South Gregg Street. Lesser and neighbor Beth Bilderback organized the history‑research workshops. Debbie Bloom, manager of the Walker Local and Family History Center at the Richland County Public Library, helped people use city directories and digitized versions of the The State newspaper to learn more about who used to live in their houses. For instance, Bloom said, newspapers of that era often carried lists of building permits, which can show when rooms might have been added to a house. Although Lesser said no one discovered anything shocking, he said several people told him they were getting addicted to research. Remembering context and distinguishing between the people that houses were originally built for and those who may have been excluded from these neighborhoods is essential when understanding their history and Columbia’s, said Caroline Nagel, an urban geography professor at USC. The neighborhood was home to former Gov. Duncan Clinch Heyward, for whom Heyward Street was named, but Hollywood-Rose Hill has typically been known as a middle-class neighborhood. The Historic Columbia Foundation notes that some of the early residents’ careers support that idea. For instance, the Columbia city directory, dating to 1925, shows that a secretary for the South Carolina Cotton Seed Crushers, a clerk for the Southern Railway system and a farmer all lived at 219 S. Edisto St.
Hollywood-Rose Hill’s neighborhood association and the Historic Columbia Foundation have provided residents with a useful neighborhood directory and leaflet with historical information. Today, the median house value is $353,011, according to census figures, compared with Columbia’s median of $161,100. One-story bungalows are most common in the community bounded by Rosewood and by South Marion, Heyward and South Harden streets. But the neighborhood also has colonial- and tudor‑revival style houses and Aladdin kit homes – sold through a catalog and purchased as a kit with precut lumber and design plans. Lesser, who has also led walking tours of the neighborhood, said he conducts the tours a bit differently every time but always points out the governor’s old house and the boundary between Hollywood-Rose Hill and Wales Garden, which was established two years earlier. Real estate agencies sometimes advertise Hollywood-Rose Hill as Wales Garden because the larger, elite houses that characterize that neighborhood hold a certain cachet, Lesser said. He said he wants to maintain the identity of Hollywood-Rose Hill’s historical homes partially in hopes of preserving a sense of scale. A centennial gala, a garden tour and an updated neighborhood directory are still in the works as part of the neighborhood’s celebration. The April 11 gala will be at 701 Whaley, with people invited to wear period dress from the early 1900s. Listen to what Debbie Bloom at the Richland County Public Library thinks residents can learn by conducting a house genealogy. Bloom explains what information is available in historical copies of The State. Watch Francis Clarke share the tradition behind the name Rose Hill (Historic Columbia Foundation on YouTube).